I enjoy being known as the hard teacher. Yes I said it. I know I have past students who will read this and know exactly what I’m talking about. That first day of school when we go over my expectations and repeat a million times Permítame ir al baño, I see the fear in my students’ eyes, and I continue on. I look past all of the versions of that question (my favorite and most common is Pear-mee-tah-may ira albino). I smile every time I think of a student saying it that way because, believe it or not, I understand. I was there once. I was scared, and I never wanted to speak out loud. It’s not that I want my students to think I’m mean, and it’s definitely not the fear in their eyes that drive me to do what I do. It’s because every first day of school I see that fear in so many of their eyes, and I know what’s about to happen to them in the upcoming months. I know that they are going to be successful in my class, and their confidence is going to be boosted, which will seep into their outside lives even if just a little. I know that I will get to be the person who sees their eyes light up when they finally get a concept they’ve been working on for what seems like forever to them. That’s one of the most exciting moments for me as a teacher! I enjoy being known as the hard teacher because, even though I’ve had administrators tell me my expectations are too high, I know that my students can and will rise to meet those high expectations. It only seems hard to them at first because we’ve become a world where expectations are lowered and concepts are “dumbed down” because someone higher up doesn’t believe students are capable of working with the intelligence God gave them. I think the problem really is that those in control don’t want to work harder to get every student to a successful place. It is hard, and it is time consuming. I’ve had moments where I wanted to just pass everybody so I didn’t have to stay and tutor or grade more thoroughly, but how does that benefit the student? What’s the purpose of my job if that’s what I do? I enjoy being known as the hard teacher because that means I’m actually challenging my students, and I can assure you that when my students enter their next Spanish class, they are grateful to me. I know this because I’m told every year. All students – all people in general – need to know someone believes in them. They need to know they are capable. At the same time, they don’t need pressure of making all As because everyone has a subject in school that just doesn’t click with them. Instead, students need high expectations set and someone with a watchful eye that sees they are working as hard as they can who also showers them with praise for all of their hard work. As a teacher, I have the ability to make a C feel like an A. If my student worked to the best of her ability to average a C in my class, then she absolutely met my high expectations. She doesn’t need a 100 in my class to prove that she did what I expected. By the way—the word “can’t” is not allowed in my class. All of my students absolutely can be successful. They all reach it at different times, but they can and will be successful as long as they put forth effort. I love my students. If you know me, or if you’ve sat in my classroom at some point in your life, you know this is absolutely true. While I love all of my students, each year a select few find their way into the depths of my heart. They’re usually the ones other teachers gave up on a long time ago – the troublemakers, but somehow I find a connection with them. God has blessed me with the privilege of seeing lives change before my very eyes. It makes me wonder how anyone can question if God is real because of the unexplainably drastic transitions I’ve seen. One year, I had a boy who I still hear from on occasion (7 years later). He was “the troublemaker,” and that’s with a capital T. I knew he was going to be a handful when I had to get on to him the first day of school—actually I had to get on to him before his body was even fully in the room! I started hearing other teachers complain about his behavior and attitude. He had detention with me one day, and he happened to be the only one in there, so we talked during his detention time. What did we talk about? Manicotti. Yes, that’s the only thing I remember of the conversation. I don’t know why we talked about it, but I remember telling him that my husband likes when I make it. Something about me saying that made me real to him. I was a teacher talking to him like an equal. His eyes were opened, and for the first time he saw me as a person and not simply his teacher. That was the day he changed. He helped with after school activities, he changed his attitude in my class, he attended school every day, and one day he came to me crying about something that happened in football, and he wanted to quit. We had a lengthy conversation about life, and how we will always run into a boss or authority figure who, for no reason, will be downright mean to us. We talked about how to push through those times and not allow them to force us out of the things we love doing. He chose not to quit football and continued to play on into high school. He wrote me a note thanking me for that talk and for all the other things throughout the year that had meant so much to him (bottom right). I live for these times. I live for these notes, and I tend to get them every year. What’s cool is that I don’t even do anything special. I’ve just treated these students as anyone else. There is no such thing as a “bad kid,” and I don’t allow myself to take in stories from their previous teachers. They come into my class with me being fully aware of their potential and knowing they are all great kids. I’m no better than they are. Yes, I’m their authority, and they show me respect, but I never have to demand it from them. I never have to ask for a letter of apology when they do mess up. They just feel the need to write one or verbally apologize (even if what they did had nothing to do with me). I keep every one of those notes. I read them often, and I remember those students that touched my heart permanently. I’ve been told before by my supervisors that I’m not compassionate. I’ve also been told that I care more about other things than I do my students, and boy have those words cut like a knife. I’ve found myself growing each time I hear words like this being used to describe me. I’ve been defensive, confrontational, hurt deeply, and . . . well I don’t know what you would call what I’ve grown into. If a colleague or administrator were to describe me in this light now, I would simply brush it off. I know it’s not true, and most importantly, my students could never be convinced of any truth in these words because they know better. They know I am incredibly compassionate and love them dearly. I pray for my students. It used to be that I got to school early (before becoming a mom), and I walked down the aisles and prayed over every desk naming each student who sat in that desk by name. I prayed for peace in my classroom and respect and safety. I prayed many things over each student every day, and they never knew. I became a mom, and making it to school on time was (is) difficult enough, so I stopped going early. Instead, I prayed on the way to school. I prayed over every student calling them out by name while I was driving down the road. Now, I fill my journal with prayers for students God lays on my heart. I pray for them at random times. Sometimes it’s during class, sometimes at home, sometimes in the middle of church. . . I pray for them, and I cry for them. Just a month ago I found myself crying while talking to my husband about a student who my heart has been desperately trying to reach. I’ve never cried to this extent for a student, but I couldn’t control the tears. I know God hears my prayers. Sometimes it’s hard for me understand why certain things are happening, but I know his perspective is far greater than mine. I know he placed me here, and I know he has placed specific students in my class. For what reason, I may never know. I don’t question it. I just go and be here for them hopefully as much as they need me to be. I hope this gives you a little insight, and I pray you think about your teachers’ intentions before completely shutting them out. No, not all teachers are the same, but you never know why they do what they do. Also remember that just like you have things going on in your life that can affect your work and behavior at school, you never know what’s going on in the life of your teacher. It may sometimes be difficult for her to pull herself together and get to school to teach you and help you with problems all while appearing that everything is right in her life. If you have a teacher who has made a difference somehow in your life, I encourage you to let him or her know. More than any gift card, candy, or Christmas ornament, hearing from students that they have somehow touched their lives is one of the best gifts a teacher could ever get. The gift cards and candy are long gone, but the letters I’ve received from my students in the past 10 years are all together in a folder where I can read them any time I want. Those students are so blessed. I commend you for setting the bar high. Thank you so much. Honestly, I feel like I’m just as blessed if not more to have the privilege of teaching them. I learn from them as much as they learn from me. There’s nothing like working in a career that God has chosen for me. I can’t imagine it being any other way. Misty, Mamma G, Mrs. Gatlin, you are one of the greatest teachers still to this day. It’s been years and I’ve been through many of teachers and professors since I’ve had your class, but still I could not compare any of them to you! I want to thank you so much for everything you’ve done for you current and past students, I know we all greatly appreciate it! Haha! I still have that shirt you made me for the craft fair! It seems like so long ago. Thank you so much! I really did enjoy you and your Spanish I class! OKay, you’re going to make me cry. 🙂 I look at you and am in awe of the person you’ve become. I can’t believe you’re the same little 5th grader who used to come from across the street to hang out until time for us teachers to leave. I know your parents are incredibly proud of you as am I. I enjoy watching you lead other girls now, and I can’t wait to see where God takes you next. WOW, Just when I thought I was alone. I have the priviledge to read this. I love teaching Spanish to my High Schoolers also. There is a certain pride I get when they are able to say their first complete sentence without a prompt. When I see that they are having a conversation in class because mean Senora T rule are if you want to talk the first five minutes in class it has to be in Spanish. My favorite is when I get a Spanish 3 or Ap Spanish Student run to me and say , Senora tuve un sueno todo en espanol It like seeing one of my sons take their first ssteps, ride a bike and learn how to drive a car. Your so proud of them and know that their journey has just begun. We stand back y le echamos miles de bendiciones. Gracias por tu palabras bellas. Que Diosito sigue alumbrandote tu camino. Gracias para tus palabras tambièn. I remember in college when all my dreams were in Spanish. I haven’t had the privilege of my students telling me they’ve had dreams in Spanish, but I can imagine that would make my day! Thank you for taking time to read the post. Thanks for your words of wisdom. I happen to love my Spanish teacher also. Recently i’ve been toying with the idea of whether to be a Spanish teacher, but I feel my Spanish isn’t good enough. (Although my Spanish teacher tells me differently) When you said you used to be scared to speak in Spanish it gave me a sliver of hope. Because you challenge me to use my Christian voice both in the classroom and out I have nominated you for the Very Inspiring Blogger Award. Go for it! If it’s you’re calling, there’s nothing in the world like it. It’s a ministry in itself. I’m currently thinking of becoming a Spanish teacher, as it was my major in college. What advice do you have as far as taking the Praxis test and then applying to a district? Were any of your interviews in Spanish? Did you feel as if you would ever make errors in speaking while standing in front of the classroom? I think different states require different testing. I’ve never heard of a Praxis test, so I can’t give any advice on it. I had to take 2 tests for Spanish, and they were both very difficult for me. I knew I would make mistakes in the classroom, and I do make them just as any teacher of any subject makes mistakes in the classroom. Don’t stress over things like that. Everyone makes mistakes, and it’s when a person pretends they don’t make mistakes that they lose their students. Just own it and laugh it off. It will help the students feel more comfortable because they are nervous about the same things. They don’t want to make mistakes, but when they see their teacher making a mistaking, owning it, and laughing it off, they gain a little confidence. I do believe I had 1 interview in Spanish, but I don’t remember much from it. If you feel like teaching Spanish is what you’re called to do then do it. If you only want to do it because it’s your major, though, I urge you to think a little more about it. Teaching is not like other career choices. It’s something you have to truly love and know you’re meant to be there. It’s not the job you just go to and clock in and out and do what it takes to get through the day. You must be teacher, counselor, mom, sister, aunt, friend. . .. to those students. Make sure it’s what you want, and if it is then don’t let fear get in the way. You can do it! If it’s something you know you want then you’ll be great! You too are an inspiration. Keep it up and love on those students. That’s one of the most important things you can do. I love how I just randomly found this blog while originally looking online for good materials to use for teaching Spanish to high school students for the summer. You are so inspirational and now I’m less nervous about teaching high school students. I’m a graduate student in Spanish at SFSU and loved teaching university students so now I’m taking a shot at teaching high school students just for the summer. It was a blast teaching university students and I know I made such a difference to them because they told me so. I can make a difference to anyone! I’m so glad it encouraged you. You’ll be great! I’m not sure which school is SFSU, but it caught my attention because I went to SFASU! I think whatever age one teaches, it’s a true calling. I look at those who teach elementary and can only think, “God bless you.” No way could I do that, and the thought of it stresses me out. However, those who teach elementary look at me the same way. If you enjoyed teaching at the university level, then you’ll feel the same about your high school students. 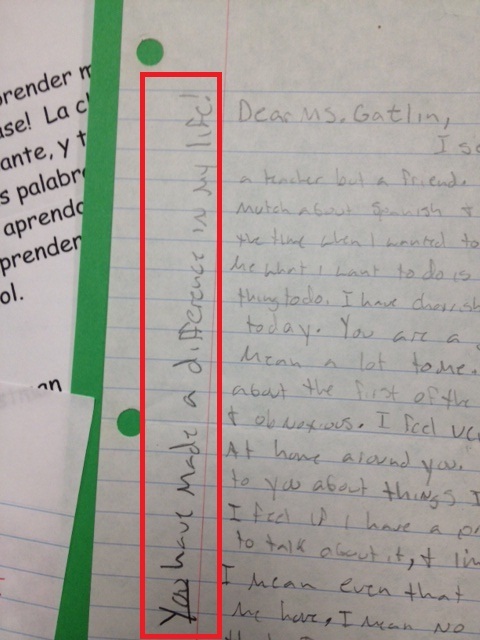 You can certainly make a difference in the lives of your students! Just remember you may not always get the opportunity to see it, and sometimes you may get to see it but years down the road. 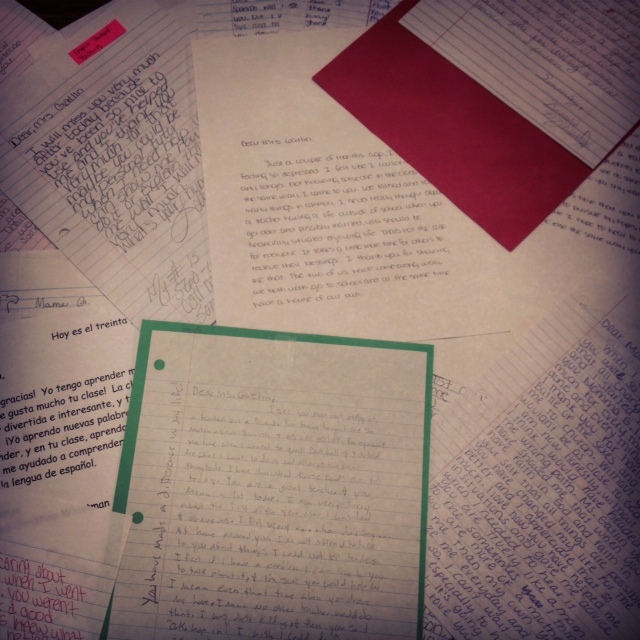 There’s so much advice I could give, but I want to give you this piece of advice: Keep EVERYTHING your students write to you, and they will! I cherish my folder with notes and cards from students. I print out emails from students and parents (parents mostly). If they were to give me something special — more than a gift card — I would suggest taking a picture of it, with the student in the picture if possible, and keep it. They will become some of the your most prized possessions over the years. Sorry this is a little late. I’m writing a 15 page academic paper in Spanish for school (SFSU) San Francisco State University. I actually really want to get this paper published in a literary magazine as I’m very excited about what I’m writing about! I’m comparing 3 novels so it’s quite an adventure. I’m also preparing to talk to middle school and high school students soon who are enrolled in Spanish classes about fundraising to be able to have their own customized Costa Rican study abroad trip this summer. They can sell Costa Rican coffee and that will pay for their study abroad trip of 2-4 weeks this summer. I’m so ready to talk to them and inspire the heck out of them to learn more Spanish and get immersed into the country I lived in and had my first taste of what it really means to connect with a different culture and start speaking the language I learned with Spanish-speaking natives. It’s sooo exciting! I love Costa Rica and Spain (where I also lived) with all of my heart. Anyways, thanks so much for all of your words. I will keep everything! Also, I so know what you mean about that you won’t always get to see the difference in students. I think I really get that because I have those professors who still make a difference to me on a regular basis and they aren’t really in my life anymore. But most of the time I make sure to always tell a professor when they make a difference to me since I believe that that is really important to do that in life. The only reason I decided to get my MA in Spanish at SFSU was because of about 3 professors in Spain who really made a difference to me and commented on how awesome I was in Spanish, literature and also about my ability to have an awesome Spanish accent. LOL! It’s not essential to have a good accent, but I certainly enjoy it. I love that I’m even able to fake people out who are even from Spain. People literally think I’m from Madrid when I speak Spanish! So fun! Anyhow, looking forward to keeping in contact! Hi I just came across ur site and im truely glad a did I am starting my second year of teaching Spanish 1-3 and I feel so nervous and unprepared. I also graduated from SFASU(Stephen f Austin) but with a business degree but life changed by path to becoming a teacher and truely feel like I enjoy it. I was just look for ideas and inspirations to be better prepare for my second yr. I would love to hear any of them and how ur journey as a spanish teacher became a success because it sound like u have achieved that with ur students!! Thank you and God bless. I just learned from my students. Listen to them. They’re all different, and each year is different. If you’re willing to learn from them, you’ll be able to teach them in a way most don’t. Enjoy your year!! Im about to start my first year teaching high school French and I am beyond scared that I won’t be a teacher like you! I hope that I have the courage to be the hard teacher and leave the impact to be the loved teacher. You will be amazing because it all comes from what’s in your heart. Thank you so much for sharing. This definitely is God getting me to read your story. I’ve been a first grade teacher for 8 years and now moving to middle school to teach Spanish. Moving from a “class A” school to a minority “class B” school. I know God is moving me for it was not my move but His. Hope in The Lord that He will use me as much as He has used you to touch the lives of the students. Prayers for you. You’ll be great! I can relate as I too am a high school Spanish teacher. I have not received any fully written letters yet, but I have had students who were inspired by me and spent tons of their free time hanging around my room just to learn more and have a good time. Thanks for the encouraging post! The fact that they’re choosing to spend time with you speaks volumes. They wouldn’t be there if you weren’t impacting them in some way. Professor Misty I loved your blog, it is very inspiring. After so many major in mind I finally chose Spanish and currently working on my college degree to transfer to a university. I cannot explain why is that I would love to teach and learn more in depth the Spanish language. As a native speaker I still have a lot to learn, and you know what excites me.. is that I get to share my time with other Spanish speaking students from different countries, which I find it neat. Thanks again professor you make a difference in this world. How exciting!! Keep that passion alive, and you’ll never have to work a day in your life because you’ll be doing what you love. Absolutely a blessing, so God to me, estoy por empezar mi primer curso para ensenar Espanol a grados de preparatoria en el sistema publico mi carrera es ingenieria pero certificandome en Espanol para cubrir el requisito de maestra de espanol y yo por “accidente” tope con tus confesiones pues buscaba algo de consejos pues como te mencionaba es mi primea vez, y me han sido de bendicion tus confesiones y me han alentado pues ya he estado orando por mis futuros estudiantes y en mi corazon ser de ayuda a ellos. Tendras otros consejos para mi? How exciting! Everyone has asked me for advice on teaching. Maybe I should start writing more on it. Just pray for your students as you already plan to, and listen to them. Really listen to your students, and at times you’ll need to listen to words they aren’t even saying, but you can do it. You’ll find something in yourself you didn’t know existed. Good luck this year. Love on those kids and never be above apologizing when you make a mistake. You WILL make mistakes, and it’s okay. The students will respect you so much more when you own up to it. We all mess up, and a teacher who can’t admit it can’t gain respect of their students. Gracias! y continues desarrolando los regalos de Dios para cumplir su proposito en ti. Thank you so much for that comment. Stay in touch with that teacher if possible. That’s so meaningful to teachers — to have former students stay in touch. I love hearing from past students and seeing what’s going on in their lives. So, I googled “Being a Spanish Teacher” and this was in the first few links that popped up. My journey to becoming a teacher is one of ups & downs, but to make a long story short, I talked myself out of my original Spanish Education degree & ended up in a job I can’t stand. I’ve regretted changing my major every day since the day I realized I couldn’t realistically turn back (about half-way through my last year in college). However, now I’m getting married and realized that my God-given passion is still in teaching. Trying to make my engineer-fiance understand my desire and need to follow this passion now when life has caught up to us (& finances are tight) has been an uphill battle, but being Christians, he understands my need to follow my passions and calling. So, every night for the past week I have spent hours scouring the internet for encouragement and things to get me started before hopefully returning to school sometime in 2014. Let me just say… I’m SO thankful I came across this! Misty, you remind me of my high school Spanish teacher who was my original inspiration for becoming a Spanish teacher. To at least 98% of the student population, she was the “Spanish Nazi,” but to me she was an amazing mentor. She pushed us and made sure we were ready for whatever came next. I’m so thankful for teachers like you. I always was so grateful for amazing teachers when I was a student, but now that I’m looking at becoming a teacher I see a whole new aspect of being thankful for those teachers. I’m thankful for you (and others like you) who are great examples for what I want to be and I can push myself toward. I know it’s possible & I can do it… reading things like this helps me immensely. Misty, I’m currently in college studying to be a spanish teacher. I have been doubting myself, my abilities, and the desires and passion that God has put in my heart. As silly as this sounds, I literally googled “should I be a spanish teacher” and I stumbled upon your blog. Reading this gave me confirmation that I am following the right path. Although I have just started I know that this is where God wants me. You are such an inspiration and I pray that you continue to be blessed. Thank you so much. Thanks a lot for your thoughts. Very inspiring. Tengo la impresión que eres una persona buena, simpática, y fenomenal…tengo una profesora que es buena, y pienso eres como ella 😀 A ti te gusta enseñar español? Sé te gusta enseñar, pero, a ti te gusta español specificalemente? O es él de enseñar en general que te gusta…i apologize for the grammatical errors contained…. Finn — Thank you very much. Your grammar is fine, so no worries. What makes me the teacher I am is that I’ve found what works for me, and I keep it real by being myself. Just be you, and you’ll be great! I do love teaching Spanish, but I work at a very different capacity than I did years ago, so it doesn’t look like what I had written in this post. I cherish those days, but I love where I’ve been placed. Yes, Spanish is what I prefer to teach, although I enjoy teaching Creative Writing as well because I love finding the student who doesn’t think they’re very good at writing, but when they find their passion, they can’t get enough time to write! For me, it’s the same as that moment I’m teaching Spanish and see the light bulb turn on in their heads, and they understand and have so much confidence. I am smiling….as you and I must be long-lost sisters. I, too, teach HS Spanish. I, too, pray for my students. I, too, have the infamous reputation of being the hard teacher. Great blog entry. Look forward to hearing more of what you have to say! ¡Que siempre seamos así! Thank you for sharing all of this…what an inspiration!!!!! I am also a high school Spanish teacher (new at that)! I have been getting a lot of resistance about setting too high of a standard for my students. It really saddens me. It’s difficult sometimes, but just do the best you can with those students even if your best is simply silently praying for them. I, too, teach HS Spanish, and tripped onto your blog. I think I love you. Lol I am also a Spanish Nazi with high standards. The other two Spanish teachers just thought I asked too much and expected too much, but the students love my class! They know I am passionate about my subject, passionate to see them learn and grow, and passionate to teach them about life in general… not just what the book says. 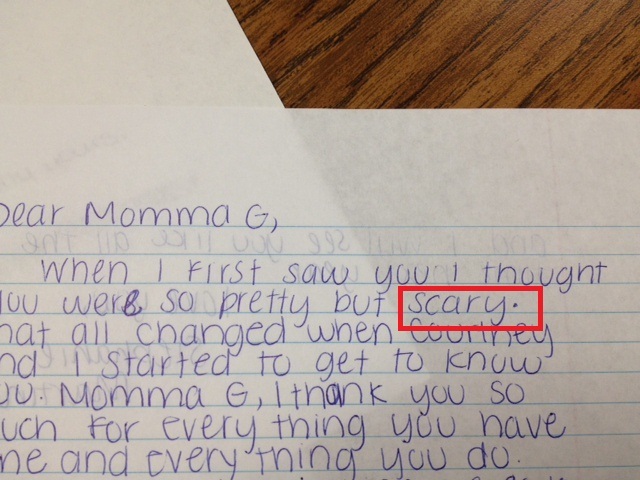 Many common errors seen at the beginning of Spanish II were quickly wiped out with great explanation and practice. I try to use many easy to read PowerPoints and out of the box thinking tools. I used to teach English, and will never forget my first year. I delved into writing and forcing the students to allow themselves the ability to express themselves creatively, focusing on ideas and organization instead of grammar. At the end of that year, one girl came to me with a card that said “all my life teachers have told me I was stupid ’cause my grammar sucked, but you cared about me and my thoughts. I just want you to know that for the first time in my life I read a whole book, and am starting on a second one.” like you, I have many such stories. You are right… this is a calling, not a job. Great insight! Thanks for the pick me up and support for our profession! I, too, just happened upon this website. I have just applied for two teaching positions and am waiting to find out if I will be offered the one I want. I know I can have the other one but it requires a 49 min drive with many winding roads. I was asked to resign or be terminated from my last teaching job by a principal who described me as “one of the most passionate teachers he has known.” Unfortunately, several very outspoken parents (one was the principal of the middle school in the same corporation) were upset with grades earned by their children. I had retired for a year before this school called me and begged me to come and teach. I missed the year of the new evaluation system, dealing with domains, SLOs, etc. I had only used an iPad with my then 2 yr old grandson and now I was surrounded by every student with one. I had never used a laptop and was handed a MacBook to be used as my Bible. I embraced my new learning curve and my students were thrilled to become teachers as they “graded” me as I learned to navigate my way through Computerland. In spite of the helicopter parents, I had one of my best years ever. On the first day with students the teachers performed a flash mob dance and of course I (the 2nd oldest teacher in the building) was asked to start it. I even wore my tutu all day. (Don’t let the silver hair fool you!) Then a week after school was over I discovered that 49/80 students had been given grade changes. It was a 100 point project. Most of my students did very well, earning all 100 points. Now all of them have 100 points-even ones that did not turn one in. I have loved this profession for over 40 yrs. I am just sad to see how much education has changed during that time. I pray for the new teachers with that “fire in the belly” that you have the strength to hand in there! I’m in college, aspiring to be a high school Spanish teacher. I began school with the intention of going into a full time ministry. I had no idea what this looked like at first and never understood how much of a ministry teaching can be. As God’s shaped me and made my passions evident, I have become so excited for my future. I appreciate your Christian perspective on high school teaching, and your words were an inspiration to me. I also LOVE your thoughts on being the “hard teacher.” I think there is FAR too much obsession over having perfect grades and not enough focus on truly understanding a concept and accepting a challenge. As a student, I needed to here that. I’m guilty of freaking out about my 3.9 this semester (because I was .1 from perfection). I want to teach my students about the value of hard work and using your God-given intelligence to overcome difficulties rather than obsessing over a GPA.